Plan oblique relief is a different, but nonetheless still fascinating way to present topography. This map-like display is used mainly on small and medium scale maps. Mountains are shown in a side-view, “standing up” in partial profile. The map user views the earth’s surface like he would from an aeroplane. Thus it astonishes even more that these maps came up before the first planes were invented. A wonderful example for an early map using [a projection similar] to plan oblique relief is the “Reliefkarte der Centralschweiz” (relief map of Central Switzerland) by Xaver Imfeld, 1887. “Reliefkarte der Centralschweiz” (section) by Xaver Imfeld, 1887. Plan oblique relief uses a conventional orthometric ground plane, presenting the mapped area without distortion. This results in major map features, such as country borders or river networks, to appear as in conventional 2D maps while elevations are seen laterally with pronounced three-dimensionality. 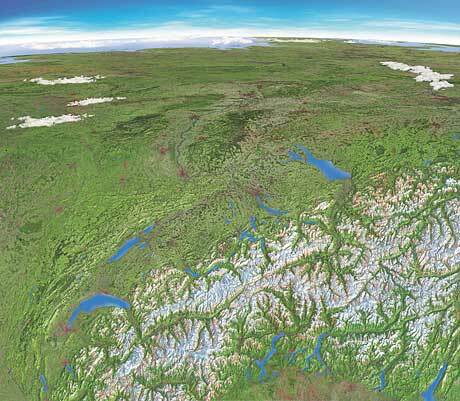 The map of Switzerland below uses plan oblique relief in the foreground. The upper part of the map depicts Germany and neighbouring countries, using satellite imagery that is spherically distorted and perspectively foreshortened to add spatial depth. A cartographic browser app developed by Jonas Buddeberg, Bernhard Jenny & Johannes Liem (2014) allows the user to manipulate the DEM on-the-fly with various tools. Jenny, B., and T. Patterson (2007). Introducing Plan Oblique Relief (pdf). Cartographic Perspectives, 57, 21–90. Jenny, B., Buddeberg, J., Hoarau, C. and Liem, J. (in press). 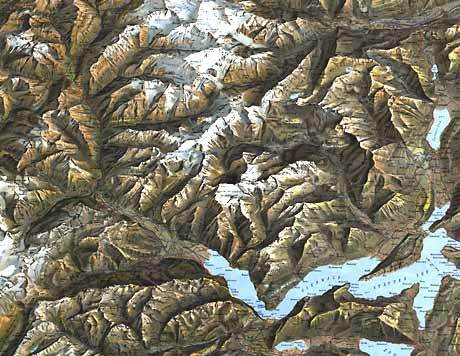 Plan oblique relief for web maps (pdf). Cartography and Geographic Information Science. MapCarte 182/365: Reliefkarte der Centralschweiz by Xaver Imfeld, 1887. Blog entry by Kenneth Field, 2014. MapCarte 264/365: Plan oblique relief Europe by Jonas Buddeberg, Bernhard Jenny & Johannes Liem, 2014. Blog entry by Kenneth Field, 2014.